When the last French king in the direct Capetian line died in 1328 AD, the English king Edward III, who already held a large part of France, claimed the right to rule all of France – to be the king of the united empire of France and England. At this time Edward III was only eighteen years old. War broke out in 1338. At first the English won some big battles. But the war went on and on, even after Edward III died in 1377. Partly because of the Black Death, neither side could really end the war. Under their new young king Henry V, the English won a especially big battle at Agincourt in 1415, where Henry used a new weapon, cannons, to help him win the battle. The English managed to take over almost all of France. But Henry V died young, in Paris, and after he died, the French started to win again under a great military leader, a woman named Joan of Arc, who recaptured the towns of Orleans and Reims, among other places, for her king, Charles VII (Joan got support from Charles’ powerful mother-in-law, Yolande of Aragon). Charles VII of France was 19 years old when he became king, but his mother-in-law Yolande of Aragon held a lot of the power until she retired about 1435, when she was about fifty years old. Even though the English eventually captured Joan and burned her alive in Rouen in 1431, the French continued to win the war and in 1453 the English king Henry VI (the son of Henry V) gave up his claim to rule France. 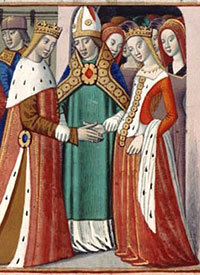 Henry suffered from mental illness, and his wife Margaret of Anjou ruled for him. 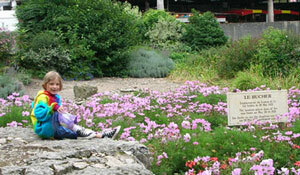 Henry and Margaret lost all England’s land in France except the port at Calais (kal-AY). Henry V directed by Kenneth Branagh. It’s a great movie. Cite this page: Carr, K.E. Hundred Years’ War – Medieval Europe. Quatr.us Study Guides, August 2, 2017. Web. April 20, 2019.